iPot (MEGIPOT) at Pure Design / Accessories / Lighting ::: Furniture for the Home, Office, Home Office, and More at Pure Design Online! The iPot from Offi brightens any desktop or shelf with a trio of automatically changing colors - Cool Blue, Soft Red, and Smooth Purple. Add a new dimension to your favorite Bonsai plant, or simply use it to hold pens, paper clips or any other small desk accessory. 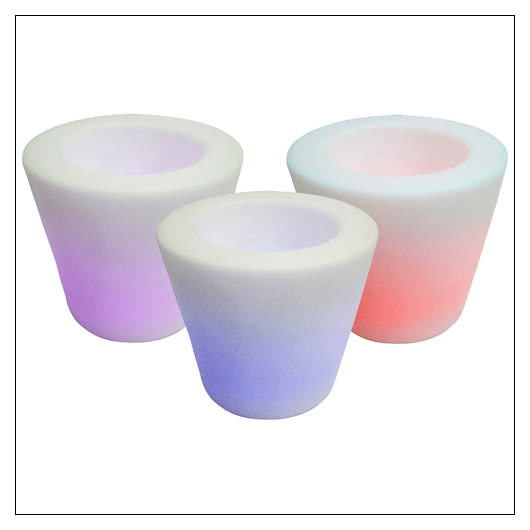 The iPot is made of non-toxic, odorless plastic with soft low-power LED lights which rotate through the three colors. 3 rotating colors. Rotationally molded liquid PVC plastic is non-toxic and odorless. Bulb is a long-lasting LED light. You can use either the USB cord (included) by connecting it to your computer, or three AAA batteries (not included) to power the iPot.